The Medical Imaging Department of the Lebanese Hospital Geitaoui - UMC is located on the GF, and provides its diagnostic services 24/24, 7/7. - Saturday from 7am to 1pm. - For the Scanner, MRI and Ultrasound: the on-call radiologist ensures the interpretation of the exams. - For all imaging exams (except ultrasound), the on-site technician performs the required exams. - The results (report + CD / DVD) are given to the external patient or transferred to the clinical wards (for hospitalized patients) within 24 to 48 hours. The Department of Radiology offers comprehensive imaging services and advanced procedures to diagnose and treat a wide variety of conditions. 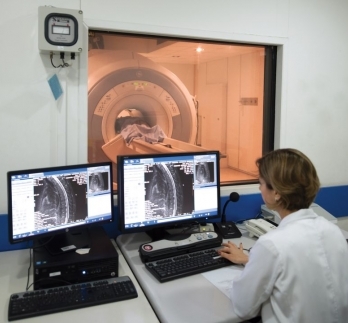 Our radiology specialists have expertise in virtually every imaging area, including breast imaging, abdominal imaging, neuroradiology, musculoskeletal, interventional and vascular radiology. CT-Scan Unit: containing a CT-scan 64 slices performing all possible examinations including cardiac CT.
MRI Unit: containing a 1.5 T digital MRI performing MRI of the whole body including brain, spectroscopy, spine, extremities, breast, prostate, and vessels. Women Health Unit: Breast imaging (digital mammography/breast ultrasound), bone densitometry and ultrasound guided breast biopsies as well as gynecological and obstetrical ultrasound. Interventional Unit: performing sophisticated interventional procedures (such as TIPS, chemo-embolization, therapeutic embolization for bleeding, varicose veins, radiofrequency ablation, nerve blocks, percutaneous biopsies, intra/retroperitoneal, pleural and biliary drainages). In addition, the department has several x-ray units and three ultrasound examination rooms to meet all subspecialty requirements including cardiology (Stress echocardiography and TEE). Moreover, our studies are integrated and archived within a PACS system (picture archiving and communication system) that benefits from a continuous upgrading keeping our service at a very high level of efficiency and accurate diagnosis.